Top row: Angela Lansbury, DBE; as sleuth Jessica Fletcher in “Murder, She Wrote”; as the batty medium Madame Arcati in the 2014 London West End production of Noel Coward’s “Blithe Spirit”; Angela’s mother, the Irish actress, Moyna MacGill. 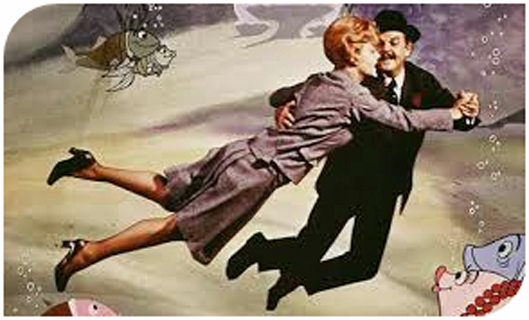 Middle: Scenes from one of her most famous films, “Bedknobs And Broomsticks” (1971), showing Angela with the children in her care and with co-star David Tomlinson. 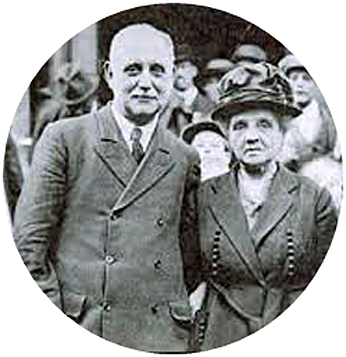 Bottom: Prominent politician George Lansbury, Angela’s grandfather, who became leader of the Labour Party; George Lansbury with his wife, Elizabeth Jane Brine. 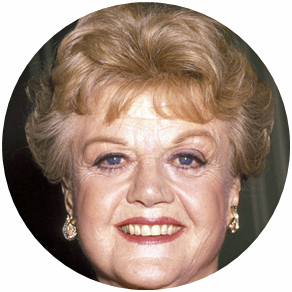 THE veteran actress, Dame Angela Brigid LANSBURY, was born on 16 October 1925 at Regents Park, London. She is a stage, film and television actress and a Hollywood legend. Of 50 films, her best-known roles were in The Manchurian Candidate (1962) and Bedknobs and Broomsticks (1971), both of which won her Golden Globe awards. 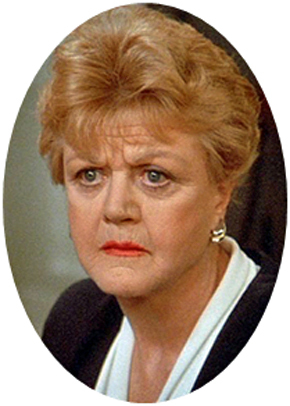 In the 1980s and ’90s she became a major television star with her many appearances as Jessica Fletcher in the crime thriller series, Murder, She Wrote. In 2014 she returned to the stage in London’s West End for the first time in 40 years in the Noel Coward play Blithe Spirit, playing the spiritualist medium, Madame Arcati. 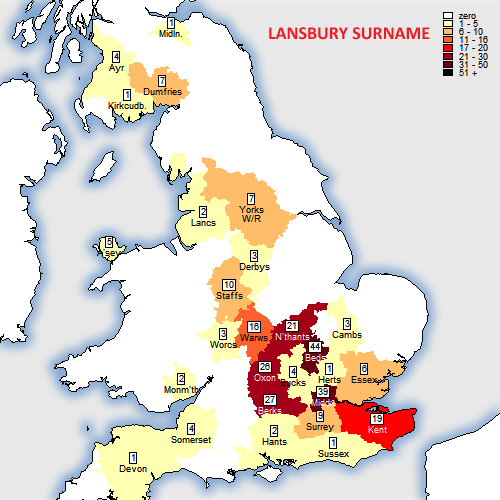 Lansbury is an uncommon surname. Even with eight variant spellings, there were only 268 people with the name in the 1881 census. Most were living in the Midlands and Southern counties of Bedfordshire, Oxfordshire, Northamptonshire, Berkshire and Middlesex (British Nineteenth Century Surname Atlas). Edgar Isaac LANSBURY was born in 1887 in Poplar, London. He died in 1935 at the age of 48 in Hendon, Middlesex. He was a timber merchant and politician. Charlotte Lillian McIlldowie was his second wife, his first wife, Minnie Glassman, having died in 1922 at Poplar, aged 32. Edgar Lansbury was a member of the Communist Party and a Mayor of the Borough of Poplar. He supported women’s suffrage and in 1921 Lansbury was one of 29 Poplar councillors jailed over a rates rebellion. Charlotte Lillian MCILLDOWIE (MOYNA MACGILLL) and Edgar Isaac LANSBURY were married in 1924 at Holborn, London. Charlotte Lillian MCILLDOWIE (MOYNA MACGILLL) was born on 10 December 1895 in Belfast, Ireland. She died on 25 November 1975 at the age of 79 in Los Angeles, California, USA. She was an actress, known professionally as Moyna Macgill. George LANSBURY was born on 22 February 1859 in Halesworth, Suffolk, one of nine children. His family moved to London’s East End, the area in which Lansbury then lived and worked for the rest of his life. He was a politician, social reformer and newspaper editor of the socialist Daily Herald. He campaigned for social justice, women’s suffrage and world disarmament. He started out as a radical Liberal but in the 1880s converted to socialism and became leader of the Labour Party, twice serving as MP for Bow and Bromley. He died on 7 May 1940 at the age of 81 in London. Elizabeth Jane BRINE and George LANSBURY were married on 29 May 1880 in Whitechapel, London. Lansbury had met Bessie, the daughter of a sawmill owner, when she was only 14. They had 12 children. In the mid-1880s the couple emigrated to Australia with their first two children, lured by the promise of “boundless opportunities”. However, Lansbury found work was hard to find and living conditions were extremely squalid. He complained bitterly in letters home, calling Australia “a little hell on earth”, and eventually Bessie’s father, Isaac Brine, paid for their return passage to England. Elizabeth Jane BRINE was born in 1861 in Whitechapel, London. She died in 1933 at the age of 72 in Whitechapel, London. In the course of researching George and Elizabeth Jane Lansbury, I came across a somewhat startling discovery! Their marriage appears TWICE in the marriage indexes of the General Register Office for England and Wales, firstly in 1880 and again in 1885, both at Whitechapel, Middlesex, in London’s East End. What was going on? Two entries, apparently for the same marriage, on the FreeBMD website. The first one, in 1880, is correct, the second entry is a mistake as a result of a muddle at the registrar’s office. To try and solve the mystery, I checked at Ancestry’s London Parish Records 1754-1921 and discovered that the marriage did indeed appear twice there. I decided to download both certificates – and this revealed the reason for the confusion. 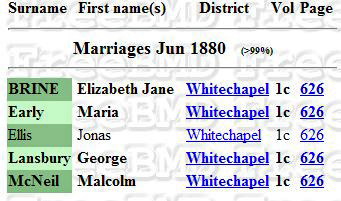 The marriage took place on 29 May 1880 at St. Mary’s Church, Whitechapel. However, when I looked at the certificate for the second “marriage” I saw that it was virtually identical but had been annotated with comments across the top and down the left-hand side. Across the top of the certificate was written: “Several leaves turned over by mistake, see entries page 114”, while the annotation down the side read: “Several leaves have been turned over by mistake. The entry of the marriage of Lansbury and Brine on page 114.” Clearly, this was an error in the original registers at the church and not at the GRO. The second marriage entry in 1885 should have been deleted, but at the time of writing it is still in the indexes. The genuine certificate for the marriage in 1880 showed that George Lansbury was of full age and a coal agent, with his father named as also George Lansbury, a contractor. Elizabeth Jane was a minor and her father was Isaac Brine, a veneer dealer. Two certificates for the same marriage but in different years! The first one, above, is the genuine marriage on 29 May 1880. The second certificate has been annotated to explain the error. 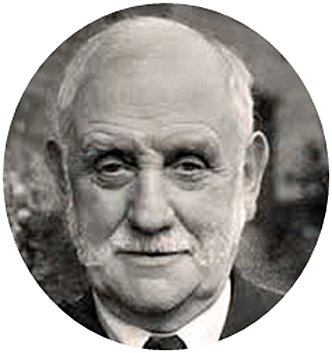 George LANSBURY senior was born on 7 Apr 1833 in Harborough Magna, Warwickshire. He died in 1875 at the age of 42 in Whitechapel registration district. He was a general contractor. Anne FERRIES and George LANSBURY were married in 1855 in Pontypool Registration District, Glamorgan. I have not discovered what George was doing in Glamorgan, but possibly working,. Anne FERRIES was born circa 1837 in Clyro, Radnorshire, Wales. She died in 1879 at the age of 42 in Oxford registration district. James LANSBURY was born circa 1802 in Middle Aston, Oxfordshire. He died in 1878 at the age of 76 in Bromley, Kent. He was a railway worker. Mary FRANKTON and James LANSBURY were married on 25 Oct 1824 in Church Lawford, Warwickshire. Mary FRANKTON was born circa 1804 in Dunchurch, Warwickshire. She died in 1870 at the age of 66 in Bromley, Kent. 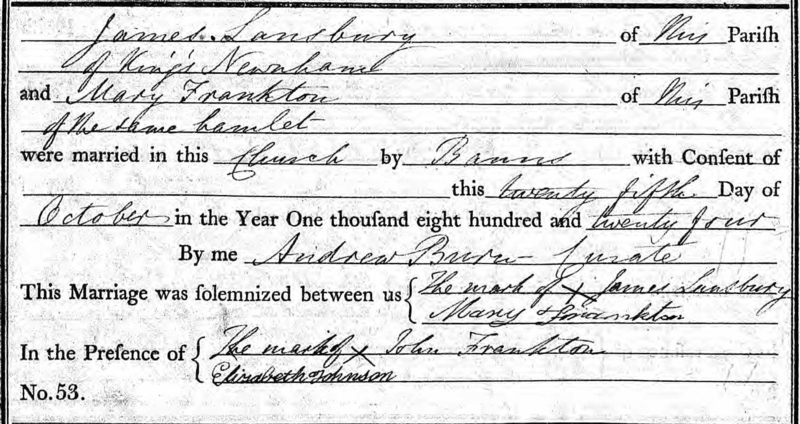 The marriage of James Lansbury and Mary Frankton in the parish registers of Church Lawford, near Rugby, Warwickshire, in 1824. Thanks for your comments. I will have a quick look tomorrow to see if I can come up with anything else that might connect you, but no promises! Your web entry was mentioned in the Rugby Family History magazine under a heading about Angela Lansbury tracing her roots to Warwickshire. I did wonder about her name and roots and seeing that her great grandfather, George Lansbury, was born in Harborough Magna in 1833 really was interesting because my great grandmother was Maria Lansbury born in Harborough Magna also in 1833; however she had a different father to George. It is a pity that there doesn’t appear to be a record of James’ parents or of Maria’s grandparents as it would be interesting to see if George and Maria were related. Thank you very much, Edward. I will try and do as you suggest. Thanks again! Thank you again, John. Yes, do please send a link to my blog to Mike Foster. I am of course entirely au fait with his book (I mentioned it in a piece I did for Tom Wood’s column in the July issue of Family Tree magazine drawing attention to this anomaly) and I will be interested in his thoughts. There was a practice of completing the register entries after the blank entry had been signed by the parties. This is obvious for the 7th.June marriages, and a possibility for the Lansbury/Brine wedding. Strictly against “Suggestions for the Guidance of the Clergy” in completing registers from the Registrar General, of course, but so is the almost universal practice of filling in the entries (save signatures) before the marriage has occurred. I think I’ll send Michael Foster (we had some collaboraton over the St.Mary’s North End and the Pike/Scrivener marriages when he was writing Comedy of Errors Act II) a link to this page, if I may. You are quite correct, John, that the error occurred at the register office and not at the GRO. I should have made that clearer, though I did mention it in the caption to the Free BMD entries, but thanks for pointing it out! I haven’t tried posting a correction to Free BMD since I suspect they will not accept it, as their records come from the GRO indexes. Your other points are very interesting too. The mistake was at the church, and presumaby the church in 1885 duly included entry 415 in its quarterly returns for June 1885. Does the Quarterly return have the year as 1880 or 1885, I wonder. 2) entry 224 has many words overwritten, not always in precisely the right alignment. 3) If the signatures are all genuine, either the mistake was spotted before the wedding-party left the church, or The Revd I.J.Kitto or the parish clerk did some hasty rushing around to collect the signatures for entry 224. The duplicate register deposited at the local register office may shed some light. If I have a moment I will look at adjacent entries.